Thanks to the joy of ClickOnce, the new beta of PjPic is self-installing and self-updating. So I won’t bother posting about it again. Unless something really interesting happens. Like it starts stripping for money. That would be postworthy. Grab from the PjPic page. PjPic – like PasteOff on steroids! On steroids, that is, without the shrivelled um… equipment and rage issues! PjPic could be called a spiritual sequel to PasteOff, in much the same way that other spiritual sequels bear little resemblance of their alleged parents. 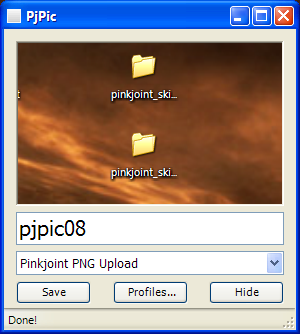 It’s got multiple save profiles (one folder per profile, one upload location per profile, one set of clipboard text per profile) – which was the biggest drawback of Pasteoff when posting to twenty blogs, uses the .Net Webclient class to support uploads to HTTP, HTTPS and FTP sites, and has a custom FTP implementation that supports active FTP. Upload Passwords are stored using DPAPI via .Net, so they’re more secure in the profile than on the wire! You copy an image to the clipboard, then double-click the tray icon to save that image in the format of your choice. More information and the download here. Projects. Are being warmed. Ohhh, yes. They are being warmed. They might not be boiling yet, but they’re lukewarm, at least. I’d like to talk about them, but… I can’t. They would know. They would find out. They would kill me. And while re-implementing all the FTP stuff already in Webclient with System.Net.FtpWebRequest/FtpWebResponse, you wonder why they couldn’t have just exposed that one little property.